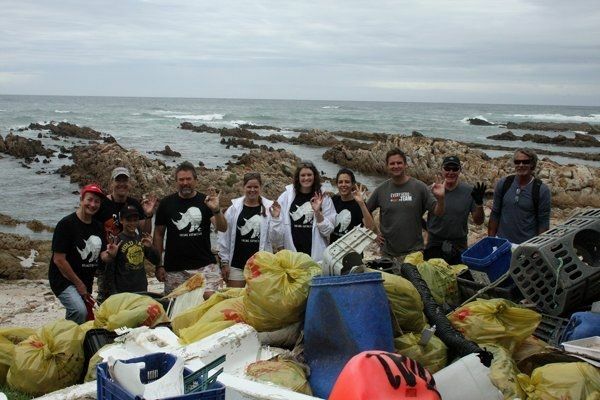 On Saturday, 24 February 2018, the OLLI Team was joined by a group of people numbering about 50 people from all walks of life; local residents, concerned open water swimmers, environmentally conscious individuals and families including children from one of our poorest communities, all with one goal in mind – to collect litter and clean up a pristine stretch of beach between Bushy Park and Laurie’s Bay on what is known as the Wild Side of Port Elizabeth. 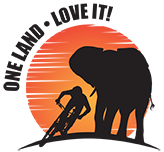 The collaboration started when Andrew Stewart of One Land Love It, and a friend, Dave Pattle of Rhino Art, walked that stretch of coast a few weeks ago. They started their run /walk at Sardinia bay and half way to Seaview came across a section of the coast which was quite rocky and clearly not frequented by people, covered in litter ranging from large 45-gallon drums to the ubiquitous plastic bottles and packets. What really made the litter problem real was when they saw two terrapins struggling to get through their pond as there was so much plastic. 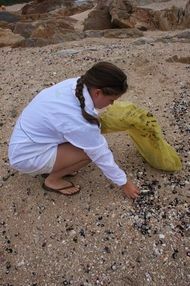 They cleaned out what they could and decided to return and organize a proper beach clean-up. As that stretch of coast is only accessible by traversing a private farm, access had to be arranged. 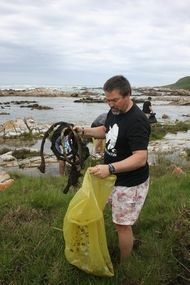 This done, they spoke to a number of groups who are involved with other beach clean ups. 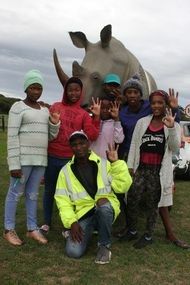 Companies/Groups like Raggy Charters and PE Master Swimmers helped spread the word that they were looking for volunteers; while Khanya Cleaning services and the beach office sponsored refuse bags. Media such as Kingfisher FM and RNews assisted in spreading the word. Saturday dawned and the organisers were so encouraged by the huge turn-out of people willing to lend a hand. Andrew Stewart commented: “At one stage I stopped to take in the scene; the rocks and beach were now littered with people of all ages collecting rubbish and I couldn’t help but notice that the ages ranged from children of about 8 years old to an elderly lady with a walking stick.” The volunteers were also amazed by the type of litter found; most of it made up of plastic bottles, packets, cable ties and bottle tops but there were also strange objects like a baby carrier, socks and drums. All in all approximately 80 refuse bags were filled with rubbish along with other items that could not fit into bags. rid our beautiful land of the curse of litter! were simultaneously happening along the PE coastline.